after downloading a conference/event it is automatically selected as the default and is ready to start. Free conference agenda is available for Android and iPhone users. Go to Android or iPhone app market and type “conference4me”, download app and choose your conference from available conferences list. IGIC 2012 has just started! You can download Conference4me and enjoy free mobile agenda of IGIC 2012 on your device! 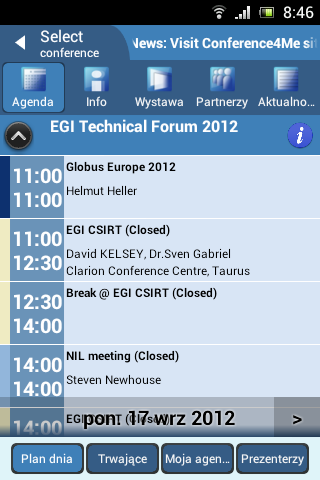 The IGIC 2012 participants can use a mobile version of the agenda for their devices running Android and iOS. In the ‘Download’ section you can quickly download Conference4me app for both platforms. In Berlin from 3 to 5 September takes place a ICCE-Berlin 2012. Conference participants can download a mobile version of the ICCE agenda from list of available conferences in Conference4me. The 2nd IEEE International Conference on Consumer Electronics – Berlin (ICCE-Berlin 2012) will bring together researchers and engineers from industry, research centers and academia to exchange information and results of recent work on systems, circuits, technologies, processes and applications in the field of consumer electronics.